Welcome to the amazing Easterland! Where kids of all ages hunt for eggs in all places! They look everywhere, 'til there are no eggs to spare! They also come to Easterland to sing, dance, and have a blast! In Easterland, the fun lasts and lasts! Join country bunnies Manny and his pal, Cottontop, on a search for Sunny the Easter Bunny, who holds sing-alongs that don't stop! 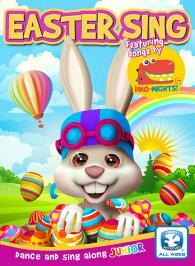 Lets go to Easterland to shake our tails, flop our ears, and hear singing friends sing Easter cheers! Easterland Sing-A-Long will put the whole family in the Easter holiday spirit with fun songs and delightful nursery rhymes!